Anyone that knows me will know I’m a total burger fiend. I crave them all the time and constantly wish they weren’t quite so naughty as they are. I load them with cheese and bacon and they are the dream. 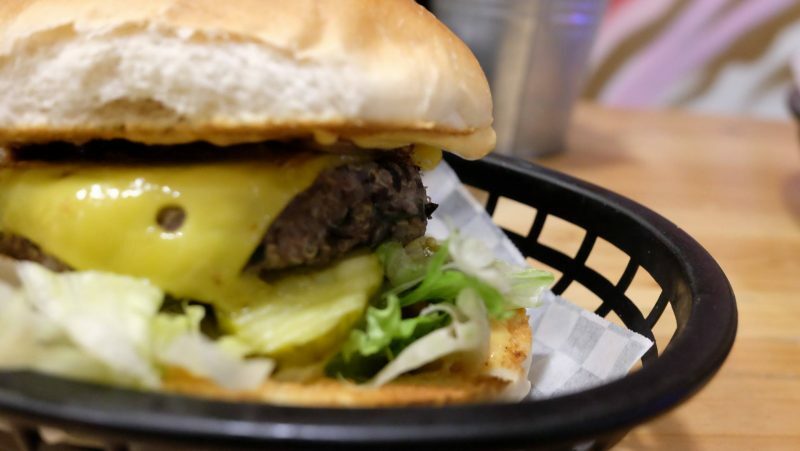 So, you can imagine how hard it will be to win me over with a vegan burger but the team at Mooshies on Brick Lane were more than willing to give it a go… read on to see my final verdict! Mooshies London specialise in Plant-Based Burgers, so they are 100% vegan-friendly. Their main aim is to do their very best to use only to use what Mother Earth has provided us with such as vegetables and fruits. They have four burgers on the menu are made from a range of vegetables that have been reinvented to give Vegans that real burger experience. With the burgers being made from the healthiest ingredients this technically makes them healthy junk food, right?! Due to this Mooshies London are slowly becoming the surrounding areas ‘Cheat Day’ treat, for both Vegans and Non-Vegans. It’s a burger but just that bit more healthy than most other non-vegan food so you’re not being too naughty! I took along my vegan buddy, Mikaela, to see her thoughts so we could get a nice balanced review! On arrival, we take a pew on a bench-like table and peruse the menu. Within a few minutes, our choices were made and I was at the counter ordered our dinner! As I’m all about a beer and a burger, I made sure this trip was no different by grabbing myself a Notting Hill Pale Ale. 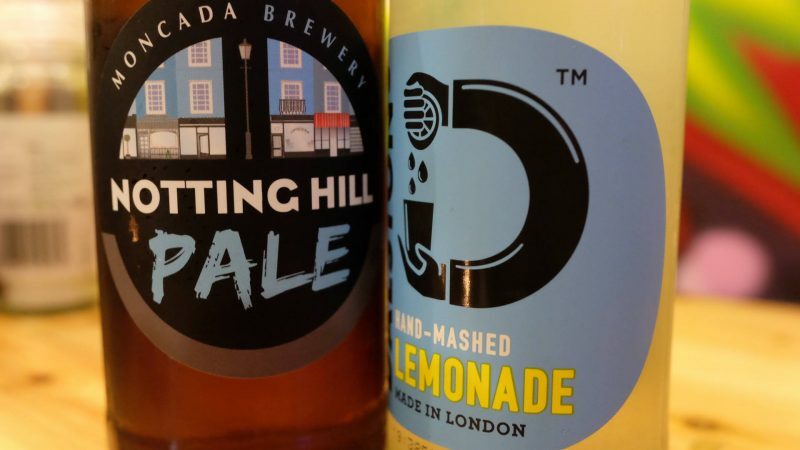 Mikaela opted to be sensible as it was a school night with some locally made Lemonade. 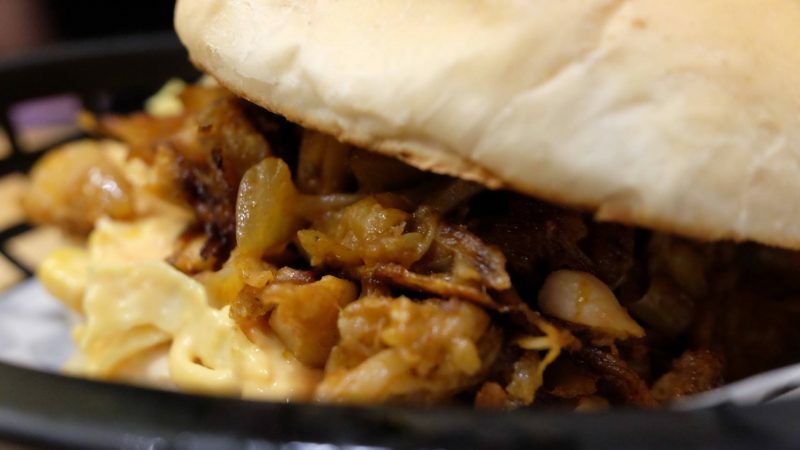 Burger wise, Mikaela chose the Pulled Mooshie made from Jackfruit, Mooshie’s BBQ Sauce and Coleslaw. How much does that look like meaty pulled pork! It even had the same consistency too! It was totally delicious! I went in for the ‘What’s Your Beef?’ burger made from quinoa and black bean patty, Mooshie’s burger sauce, caramelised onions, vegan cheese, lettuce and gherkins. and again, it was really delicious. The consistency was really nice, not quite a beef burger but I didn’t miss meat at all! It was filling, filled with flavour and I felt great after eating it! Our sides were sweet potato fries with vegan cheese that hit all the right spots, the cheese tasted very similar to the cheddar I’d eat on a daily basis! 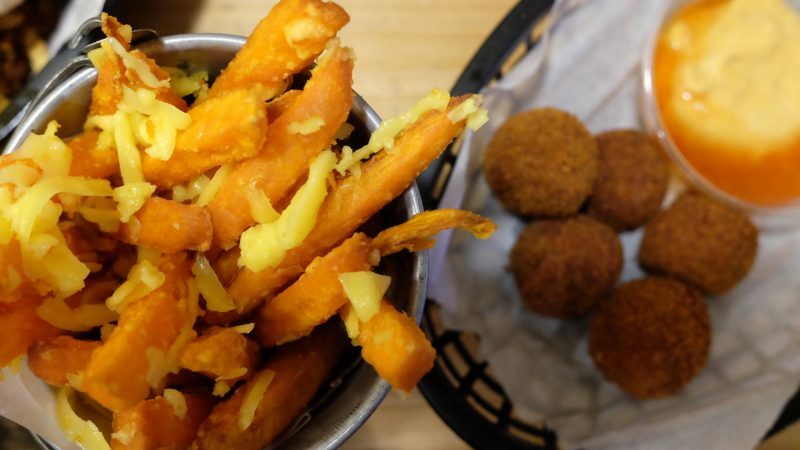 You can order sweet potato fries without the cheese too, but we are big cheese fans! We also tried the Chick P Bited with Sweet Chilli Mayo that were so good! I’d only ever had chickpeas in hummus so it was great to use them for something else! Dani and Vane from VIDA Bakery used to make cupcakes for Mooshies and they sold so well they opened their own stores and decided to come up with a new dessert idea for Mooshies in the form of Vegan Brownies! 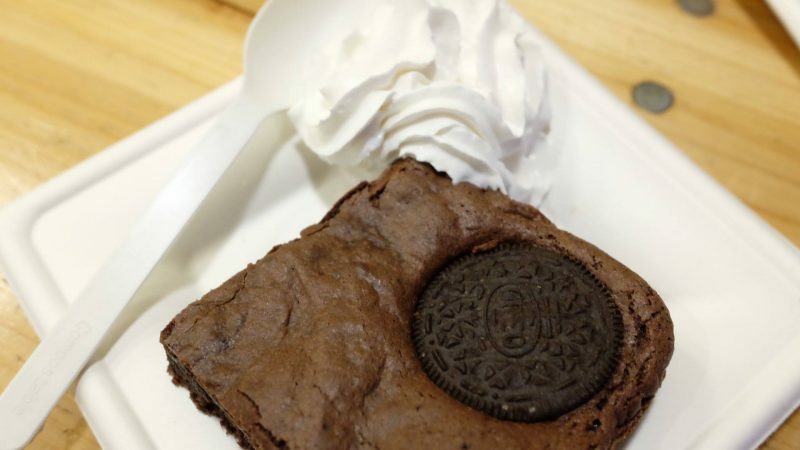 I went for the Oreo Brownie with a little side of whipped cream. I demolished that in seconds, it was that good! The brownie was the perfect consistency with a crispy outside and soft inside. 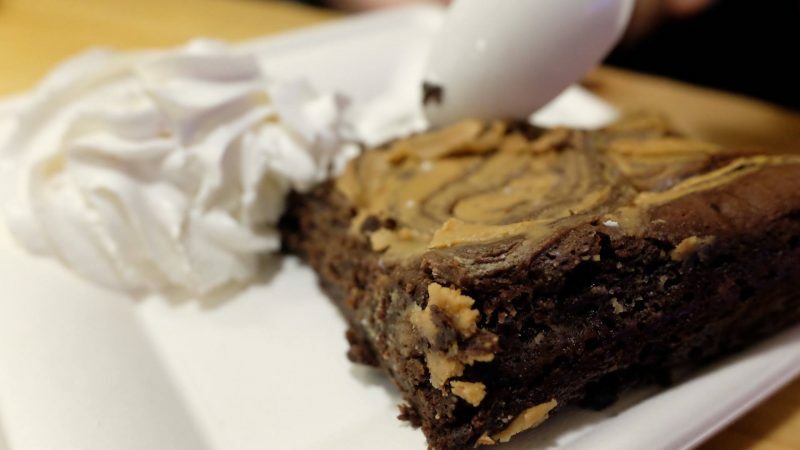 Mikaela ordered the Peanut Butter Brownie which was also mega tasty! It has peanut butter swirled throughout yet it wasn’t overpowering. Even as a non-peanut butter fan I really enjoyed my taste! I have been thoroughly won over! I obviously still love my beef burgers but I love knowing that there is a healthier option that is filled with flavour, leaves me feeling really full up, I didn’t feel stogy after and was great value for money. Have you tried a vegan burger before? The Final London Marathon Update! "Visiting The Kennedy Space Center; How to Planet! *"